Moonstruck (1987): Norman Jewison's antic romantic comedy, fueled by great and gorgeous moon images. Apollo 13 (1995): Ron Howard's dramatic rendering of a moon mission that averted disaster through the heroism of the crew and commander--and the tenacity of their support team on the ground. Famous for the line: "Houston, we have a problem." The Right Stuff (1983): Philip Kaufman's account of the origins and evolution of the U.S. space program. 2001: A Space Odyssey (1968): Stanley Kubrick's sci-fi version of space travel, with shots of a mysterious monolith on the surface of Earth's moon. By Rocket to the Moon (1931): German director Fritz Lang's serious attempt to depict a lunar landing and moon walk. Lang used rocket scientists as advisers. The Mouse on the Moon (1963): Sequel to The Mouse That Roared (1959), both directed by Richard Lester. A whimsical British satire of the space race. Le Voyage Dans La Luna (1902): A parody by French director Georges Melies of Jules Verne's and H.G. Wells's writings about space exploration. A Walk on the Moon (1999): A bittersweet romantic comedy directed by Tony Goldwyn. Graphic scenes of an adulterous affair intercut with shots of the moon landing and Neil Armstrong's walk. Great for the sociological context of the time, but not recommended for family viewing. From Earth to the Moon (1998): An HBO miniseries presented by Tom Hanks and Imagine entertainment. 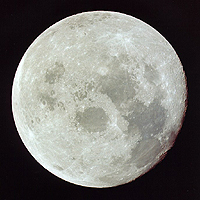 Other recent films provide memorable moon images. Steven Spielberg's 1982 E.T. : The Extra-Terrestrial uses moon phases to show the timeframe of the action and contains the unforgettable image of Elliott silhouetted against an enormous full moon as E.T. rides on the handlebars of his bicycle. Divine Secrets of the Ya-Ya Sisterhood (2002) begins with a blood pact by the little Ya-Ya's in the light of the moon. The child-protagonist sings, "I see the moon," in an attempt to calm her mother. See also director Ron Howard's Splash (1984), in which the moon is used to mark time before the mermaid, Madison, has to return to her watery world. If you use one of the previous suggestions — or are developing a film event of your own — contact MOONFEST. We'll consider posting your event as an official MOONFEST Event on this web site. The moon's effect on our planet and its inhabitants has been the subject of folklore and scientific inquiry for thousands of years. Ancient Egyptians believed that meatballs made from snake meat left to cure in the light of the full moon could heal "werewolfism." Be that as it may, it's now established that the moon affects the Earth's tides and there's a relationship between moon phases and menstruation. A recently released 30-year Stanford University study indicates stock trades increase an average 8.3 percent on the occasion of the new moon. Controversial studies from the 1950s and 1970s cite increases in violent crimes during full and new moons and psychiatric admissions on the full moon.